Summer vacations always played an important role in during my school days. I, my brother would go to my grandparents home in Trichy on the very day my exam got over and will return only the day before my school begins. There will be a big crowd with my chitti’s two sons and another chitti’s daughter. I remember waking up to the smells of sambar in the morning and hurrying up to get ready before relishing it with hot fluffy idlis. Grandpa would never allow us to sit for breakfast if we had not completed finished our morning routine. God, its holiday and we are entitled to take bath at any we want, we used to argue with him but he would hear none of it. Though my grandpa is not with us now we are all grateful for all the good habits that he instilled in us without any compromise. 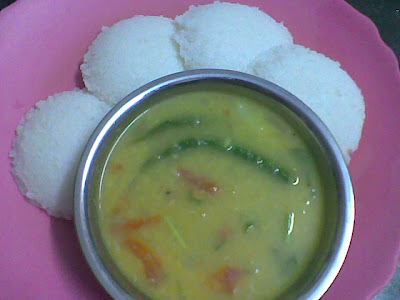 Even after I started work Sundays are really special and idli and sambar will be a must for breakfast to be eaten at leisure and enjoyment not gulping it down in a hurry during the week days. In our house we all always made it with tur dal and sambar powder. But after my marriage I came across a different variety of sambar that my MIL made during my first visit there and I must say that I really got hooked to the taste of it. She is a very special person to me and quite a jiffy in the kitchen. She taught me a lot when it came to cooking and she never failed to encourage in my new cooking adventures. This is her version of sambar to eaten with hot idlis. This sambar will not taste well with rice. Pressure cook washed dal along with the turmeric powder and chopped potatoes with 2 cups of water. 2-3 whistles should do the job. In a kadai, heat the oil and add the mustard seeds. When they splutter, add the onion and fry till they turn translucent, now add the chopped tomatoes, slit chillies, curry leaves and sauté them for 2-3 min. when the tomatoes become slightly mushy add the cooked dal along with the potatoes. Add salt and if the consistency is a little thick adjust by adding enough water. Cover and cook for 10 min in a low flame. 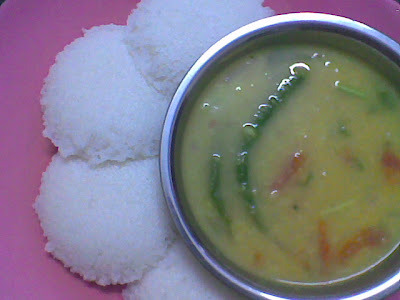 idli sambar is ready. Don’t forget to garnish with coriander leaves as they rend a nice flavor. Serve this sambar hot with idlis and dosas. Previous Post: « Chinese stir-Fried Vegetable Parathas. any suggestions/queries are most welcome..
Its the dal. It goes well with chappathi…. Looking so good. Thanks a lot.